​The CEA develops and maintains bilateral relations with nuclearized countries, countries envisaging the construction of nuclear power plants within various time frames, countries with nuclear activities other than power generation (research, medical, etc.).  In each case and depending on the context, the CEA provides support for French industry. Through its activities in the areas of R&D and training, the CEA assists industry (for instance by providing widespread access to its laboratories for persons from countries in which it has an interest). The France International Nuclear Agency (AFNI), created within the CEA in 2008, advises and assists countries which so request in creating the institutional, human and technical environment necessary for the implementation of a nuclear power generating project in the best conditions of safety, security, non-proliferation and protection of the environment. AFNI works in countries looking to establish a partnership with France. It intervenes in the upstream phase of the project, assisting with the national studies conducted prior to the decision to launch a nuclear power generating programme, as well as throughout the design and skills development process. AFNI’s actions are built around the expertise of the French public bodies specialising in the nuclear sectors, such as CEA, the institute for radiation protection and nuclear safety (IRSN) and the national radioactive waste management agency (ANDRA). The CEA is also home to the International Institute of Nuclear Energy (I2EN), inaugurated in mid-2011. The role of the I2EN is to facilitate access for foreign studies to French training programmes, in order to share best safety practices and all the knowledge essential for the responsible development of a nuclear energy industry. The institute was set up at the initiative of the Government and works with a range of international partners: universities, colleges, industrial firms, organisations and agencies.